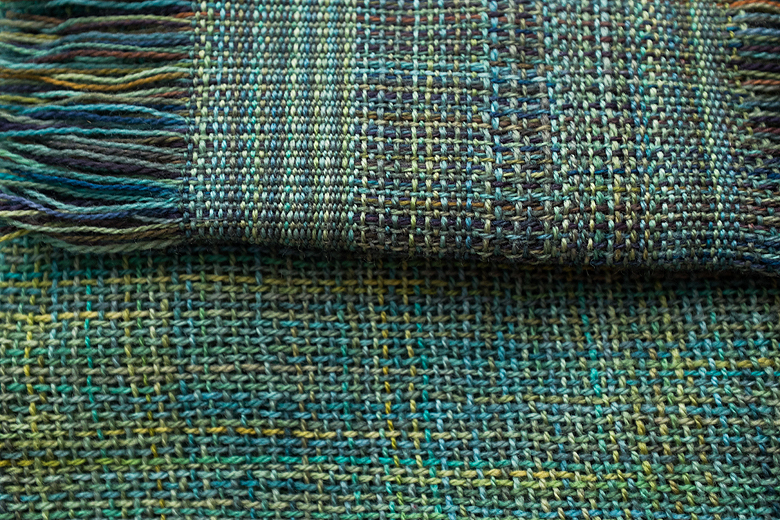 Those of you who read this blog often will know that, lately, I’ve been completely obsessed with my loom (I do have projects on the the needles, and I poured some resin yesterday, but really, it’s been all about the weaving) and, every chance I get, I try to do something new. I picked up the double heddle kit for my loom a few weeks ago, but it was only this past long weekend that I finally had a chance to warp it up. Lucky Penny and Aurora together – gorgeous! The instructions for this can feel confusing, but here is what I did. This is easiest if you use two contrasting colours (I’m using Tanis Fiber Arts Lucky Penny and Aurora in lace weight). Put the heddle closest to your back apron rod in neutral. Warp like you would normally, but pull 2 loops through every slot; one loop of colour A and one loop of colour B. Cut the yarn and reel it onto the back rod like normal. You’ll have 4 strands in each slot, 2 of each colour. Pull out one strand of colour A and pass it through the hole on the left. 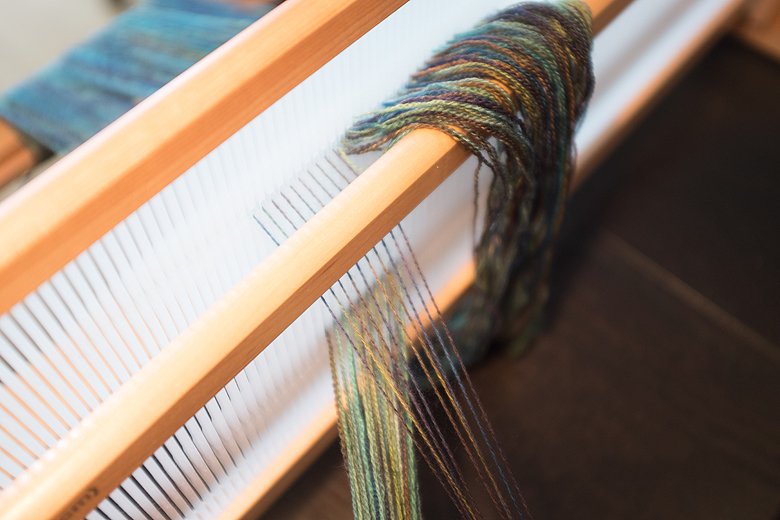 Continue across the heddle. Put the back heddle in the up position, and put the front heddle on, in neutral. Drape all your ends over the front heddle. 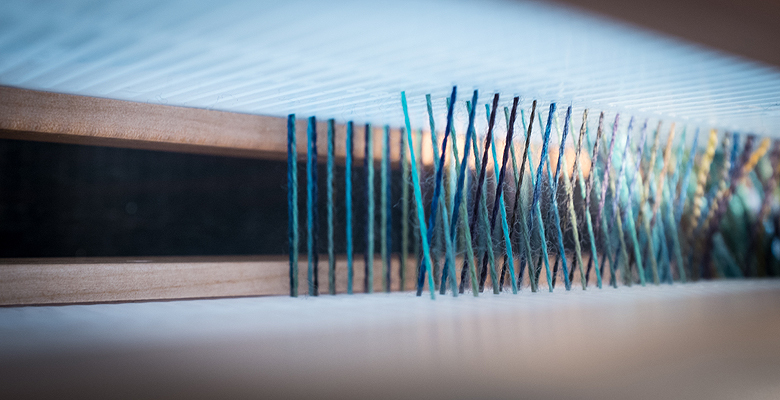 Treating the strands in the back heddle as groups of 4 (one in the hole, three in the slot) pull all 4 strands through the corresponding slot in the front heddle. This feels fiddly at first, but it gets faster as you go along. Pull up the 2 strands of colour B, and make sure they’re not crossed under colour A. Grab one of those strands and pull it through the hole on the right. The two most important things are a) that they’re not crossed under the other strands and b) that they’re in the opposite side hole from the back heddle. To work twill, with 2 pick up sticks. I warped up only a narrow band, using two 12-dent heddles. Section 1 is modified basket weave; the back heddle stays put and I moved only the front heddle up and down. Section 2 is the same weave but beating in the weft loosely. Section 3 is moving both heddles up and down. Perhaps I didn’t give it a fair chance, because I had only warped up a narrow strip, but my first thought was ‘I don’t like this’. It’s very, very fiddly. 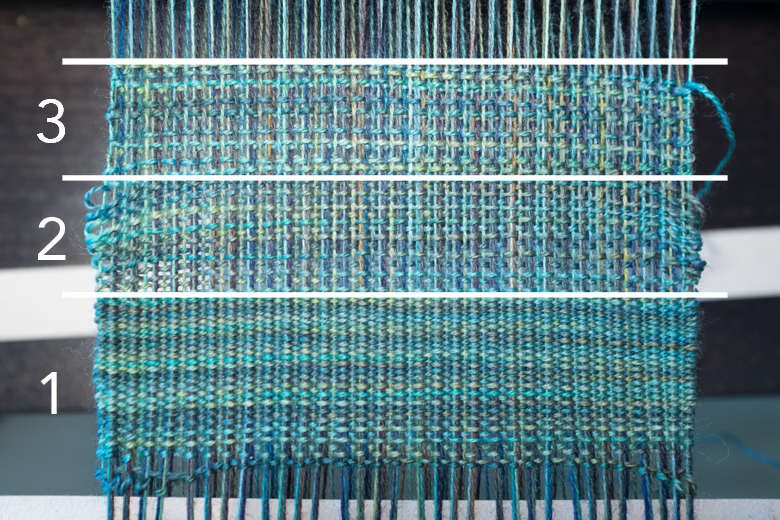 It took all morning to warp a 4″ wide piece of cloth, and the 2 heddles feel very clumsy to handle (though I think this would be solved by warping the full width). You can see the difference here: the swatch at 24 epi is very dense compared to the same yarn at 12 epi. Dense enough, in fact, that it would be great for making bags. The textures that are possible are quite lovely though, so I’m going to borrow a 7.5-dent heddle and give it another try! 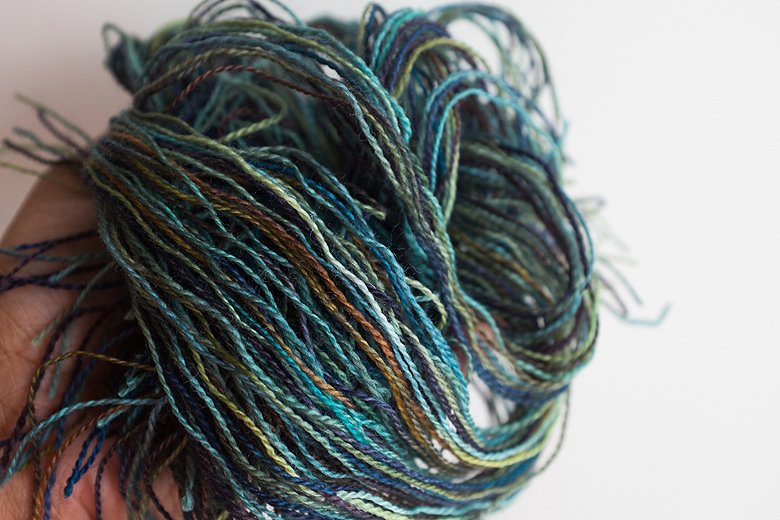 Incidentally, here is my loom waste, aren’t Lucky Penny and Aurora gorgeous together? I think I feel another warp design coming on!